Your kids can ride a Grizzly too! 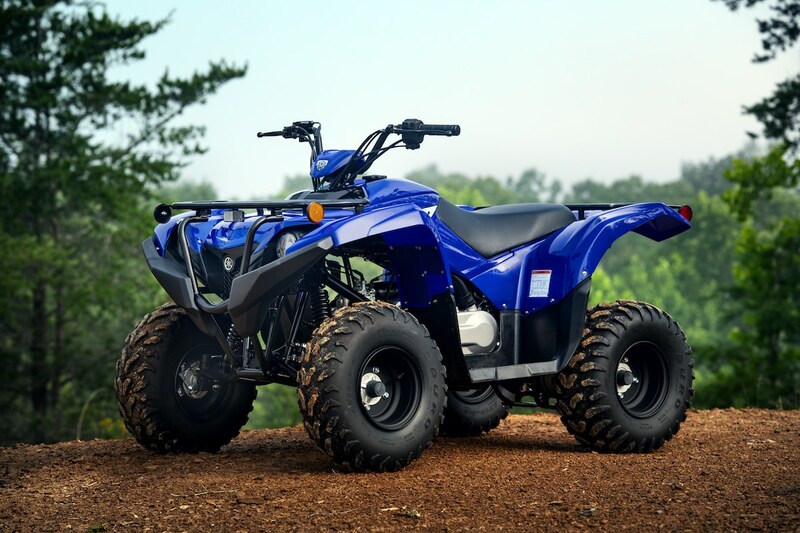 A new addition to Yamaha’s 2019 line up is the Grizzly 90! The company already has the Raptor 90 and the tiny YFZ50 available for your youth to enjoy, and we are excited for the new addition. The Grizzly 90 sports a 90cc single-cylinder, four-stroke air-cooled engine that is electronically started, with a back-up kick starter. The little motor is paired to an automatic CV style transmission that has forward, neutral and reverse gears. The suspension system employs five inches of usable travel in the front end out of a single A-arm style suspension. The rear utilizes a swingarm with 5.7 inches of travel. The styling is based off of the impressive Yamaha Grizzly 700. Just like it’s big sibling, the 90 has steal cargo racks that can actually be utilized to carry light-weight items out on the trails! Yamaha designed the Grizzly 90 for kids ages 10 and up to enjoy. Parents can adjust the throttle limiter to keep the performance tame for new riders. The hand controls are perfect for little hands to utilize and the brakes are a mechanic drum type to slow the little ATV down.